An entry of 840 cattle at Markethill on Saturday, September 29th sold in a steady demand with buyer from throughout Northern Ireland and export agents in attendance. 310 heifers sold in a steady trade. Good quality heavy heifers sold from £200 to a top of £240 per 100 kilos for a 580k Limousin at £1,395 from a Portadown farmer followed by £230 per 100 kilos for a 516k Limousin at £1,185 from a Killeavey producer. Top price heifer £1,435 for a 658k Charolais from a Portadown farmer. Good quality middleweight heifers sold from £210 to a top of £245 per 100 kilos for a 422k Charolais £1,035 from a Killylea farmer followed by 460k Limousin at £1,055 from a Forkhill farmer. Second quality heifers sold steadily from £180 to £195 per 100 kilos. Portadown farmer 582k, £1,395, £240.00; Killeavey farmer 516k, £1,185, £230.00; Portadown farmer 602k, £1,335, £222.00; Portadown farmer 574k, £1,255, £219.00; Portadown farmer 658k, £1,435, £218.00; Newry farmer 544k, £1,185, £218.00; Armagh farmer 552k, £1,195, £217.00; Dromore farmer 628k, £1,355, £216.00 and Magheralin farmer 530k, £1,135, £214.00. Killylea farmer 422k, £1,035, £245.00; Forkhill farmer 460k, £1,055, £229.00; Portadown farmer 446k, £975, £219.00; Poyntzpass farmer 462k, £1,005, £218.00; Cullyhanna farmer 430k, £935, £217.00; Tassagh farmer 430k, £925, £215.00; Newtownhamilton farmer 408k, £875, £214.00 and Cullyhanna farmer 484k, £1,035, £214.00. 305 bullocks sold in a steady demand. Good quality forward bullocks from £200 to £214 for 548k Aberdeen Angus at £1,175 followed by £210 per 100 kilos for 550k Aberdeen Angus at £1,160 from a Tandragee farmer. Top price £1,345 for 670k Charolais from a Portadown farmer. Good quality middleweight steers sold from £210 to £254 per 100 kilos for 370k Limousin at £940 from a Dungannon farmer followed by £244 per 100 kilos for 350k Limousin at £855 from an Armagh producer. Good quality Friesian bullocks sold from £150 to £178 per 100 kilos for 650k Friesian at £1,155 with a top price of £1,235 for 706k Friesian £175 per 100 kilos. Tandragee farmer 548k, £1,175, £214.00; Tandragee farmer 552k, £1,160, £210.00; Banbridge farmer 592k, £1,235, £209.00; Collone farmer 516k, £1,075, £208.00; Tassagh farmer 532k, £1,105, £208.00; Newtownhamilton farmer 636k, £1,305, £205.00; Tandragee farmer 570k, £1,165, £204.00 and Kingsmills farmer 634k, £1,285, £203.00. Dungannon farmer 370k, £940, £254.00; Armagh farmer 350k, £855, £244.00; Annaghmore farmer 410k, £1,005, £245.00; Lurgan farmer 410k, £985, £240.00; Armagh farmer 436k, £1,035, £237.00; Keady farmer 418k, £985, £236.00; Lurgan farmer 404k, £935, £231.00 and Dungannon farmer 368k, £895, £243.00. Markethill farmer 650k, £1,155, £178.00; Markethill farmer 706k, £1,235, £175.00; Markethill farmer 708k, £1,235, £174.00; Markethill farmer 630k, £1,035, £164.00; Markethill farmer 660k, £1,075, £163.00; Glenanne farmer 704k, £1,085, £154.00 and Glenanne farmer 672k, £1,025, £153.00. Just over 200 weanlings sold in a steady demand. Light male weanlings sold from £210 to a top of £268 per 100 kilos for 304k Charolais at £815 for a Loughgall farmer. The same owner received £265 per 100 kilos for 310k at £820. 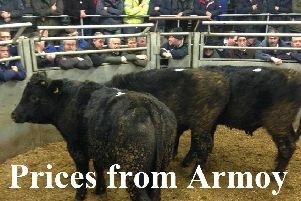 Stronger male weanlings from £200 to £226 for 416k at £940 from a Cullyhanna farmer. Heifer weanlings sold from £200 to a top of £261 for 314k Limousin at £820 from an Armagh farmer. Cullyhanna farmer 416k, £940, £226.00; Dromore farmer 412k, £920, £223.00; Portadown farmer 404k, £880, £218.00; Dromore farmer 406k, £880, £217.00; Dromore farmer 420k, £910, £217.00; Portadown farmer 444k, £960, £216.00 and Portadown farmer 426k, £895, £210.00. Loughgall farmer 304k, £815, £268.00; Loughgall farmer 310k, £820, £265.00; Loughgall farmer 300k, £780, £260.00; Dungannon farmer 320k, £805, £252.00; Newry farmer 336k, £815, £243.00; Loughgall farmr 372k, £895, £241.00; Cullyhanna farmer 346k, £820, £237.00 and Dromore farmer 368k, £850, £231.00. Armagh farmer 314k, £820, £261.00; Armagh farmer 326k, £735, £225.00; Armagh farmer 330k, £740, £224.00; Portadown farmer 344k, £770, £224.00; Milford farmer 376k, £795, £211.00 and Portadown farmer 370k, £775, £209.00.